In his Lenten meditation on Friday, Fr. Cantalmessa focused on the importance of humility, not only for personal holiness but also to build up the community and Church. According to St. Paul, people are wise when they are humble and are humble when they are wise, and that a true estimate of ourselves is to recognize our nothingness. In its most profound meaning, humility belongs only to Jesus, the Truth, said Capuchin priest Father Raniero Cantalamessa in his Lenten meditation. The preacher of the papal household delivers a reflection every Friday during the Lenten season to Pope Francis and members of the Roman Curia. Pope Francis on Friday told confessors that they have a special responsibility to help young people discern their vocations in life. The Pope was talking to participants in an annual course on the Internal Forum organized by the Apostolic Penitentiary. This year, ahead of the Synod of Bishops on young people, the course is focused on the relationship between the Sacrament of Confession and discernment of vocations. Pope Francis told the young confessors they must understand their role as instruments of God’s mercy and never seek to become “masters of people’s consciences”. Remembering they are only instruments of Reconciliation, he said, is not to diminish their ministry, but rather to assume a humble attitude of listening to the Spirit so that Christ can be seen clearly as our great high priest. Pope Francis opens the “24 Hours for the Lord” initiative by leading a penitential celebration in St Peter’s Basilica. Thousands of the faithful gathered together in St Peter’s Basilica, responding to Pope Francis’ invitation to participate in “24 Hours for the Lord.” The Pope’s homily focused on the readings chosen for the penitential celebration: 1 John 3:1-10, 19-22 and Matthew 26:69-75. The meditations for the 14 stations of the Cross on Good Friday at the Colosseum will be written by a group of young people coordinated by prof. Andrea Monda. Pope Francis wants to listen to the young, and he has decided to entrust the meditations of the Via Crucis (Way of the Cross) on Good Friday at the Colosseum to them. Prof. Andrea Monda, professor of religion, journalist and writer, has been asked to choose 15 young people and to gather their thoughts. The announcement was made by the director of the Vatican Press Office, Greg Burke. On March 17, Pope Francis travels to Pietrelcina and San Giovanni Rotondo, following in the footsteps of Padre Pio. For the centenary of the appearance of the stigmata of St. Pio of Pietrelcina and on the 50th anniversary of his death, on Saturday 17 March Pope Francis will make a pastoral visit to Pietrelcina, in the diocese of Benevento, and to San Giovanni Rotondo , in the Diocese of Manfredonia-Vieste-San Giovanni Rotondo. 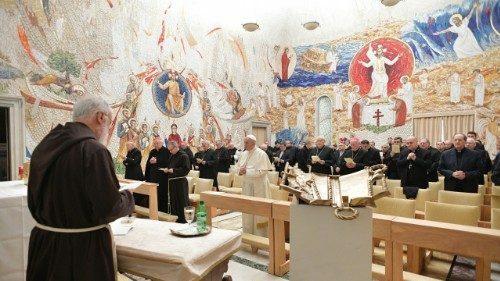 On Thursday the Vatican Press Office published the updated program of the journey of Pope Francis to the central places in the life of Padre Pio. The Pope will arrive by helicopter in Pietrelcina at 8 am: first there will be a brief prayer stop in the "Saint Francis" Chapel, then a meeting with the faithful in the square in front of the liturgical hall of Piana Romana. Finally he will greet the Capuchin community of Pietrelcina. ROME - The Vatican says Pope Francis will visit Lithuania, Latvia and Estonia on Sept. 22-25 as the three Baltic nations celebrate their 100th anniversaries. The Vatican confirmed the trip Friday, saying Francis would visit Vilnius and Kaunas in Lithuania; Riga and Aglona in Latvia, and Tallinn in Estonia. Francis has only one other confirmed trip for the rest of 2018, to Geneva in June. He is widely expected to go to Ireland in August for the World Meeting of Families. Audience of Pope Francis for Members of the Swiss Association "Fountain of Mercy"
Pope Francis calls members of a Swiss religious group to promote a culture of mercy, at an audience during their pilgrimage to Rome. On Saturday, Pope Francis received members of a Swiss association dedicated to contemplating mercy, while invoking it in the world and living it in fraternal love. The Association “Fontaine de la Miséricorde” (The “Fountain of Mercy” Association) is composed of members from four French-speaking Swiss cantons, and nearby regions of France. Its purpose is to foster the spiritual life, and a life of authentic prayer in mercy, in Geneva and the surrounding areas of francophone Switzerland. The Prefect of the Congregation for the Doctrine of the Faith, Archbishop Luis Francisco Ladaria Ferrer SJ, addresses a variety of issues, including his own relationship with Pope Francis, in this exclusive interview. Spanish by birth and Jesuit by vocation, Archbishop Ladaria SJ spent over 30 years teaching theology in Spain and at Rome’s Pontifical Gregorian University. In 2004, Pope St John Paul II appointed him Secretary-General of the International Theological Commission. Last year, Pope Francis made him Prefect of the Congregation for the Doctrine of the Faith. What is it like being Prefect of this Congregation under Pope Francis? As far as I am concerned, it’s a simple question of obedience. Pope Francis called me and told me his decision, and I said: "Holy Father, if that’s what you have decided, I accept and say no more". So that’s the first thing. Of course it is a responsibility and I must say that the first few days I did not sleep too well... But slowly you get used to the idea and see that it is possible, especially knowing this is what the Pope wants. So it’s better not to think too much about it: the whole thing is done and dusted! The publication announcing the addition of the Memorial of Mary Mother of the Church to the General Roman Calendar sparked a discussion on Facebook. Archbishop Arthur Roche, Secretary, Congregation for Divine Worship joins in. Regarding the positioning of the doctrine of Mary, Mother of the Church, within Catholic tradition, Archbishop Roche tells us that this memorial is linked to the end of Vatican II. “Pope Paul VI declared that Mary was to be known as the Mother of the Church, because her relationship with the Church is so close” due to the relationship that she had with her own Son, Jesus. Members of the Church are members of Christ’s Body. Mary gave birth to that Body. 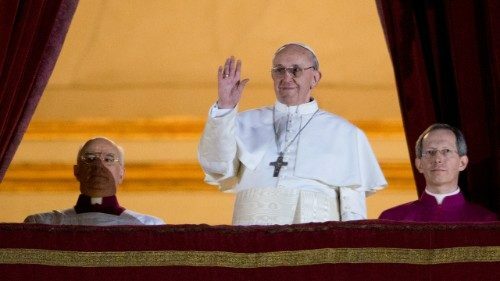 Pope Francis was elected pontiff on 13 March, 2013. Starting on Sunday, the Polish Catholics will join a prayer campaign for Pope Francis, who frequently requests for prayers. A prayer initiative organized by the Polish Church for Pope Francis on the occasion of the 5th anniversary of his pontificate, is kicking off on Sunday in Poland. “One for all, all for one!” is the title of the prayer chain that is in response to the frequent requests for prayers by the Pope. “I encourage you to join this prayer chain that connects bishops, priests, consecrated persons and lay faithful,” urged Archbishop Stanisław Gądecki of Poznan, the President of the Polish Bishops’ Conference. The prayer chain is the initiative of the Lednica Youth Movement, that gathers every year at Lednica lake near Gniezno. Over 25 organized groups and dozens of people all over Poland have declared their participation in the 11 March event. On March 13, the day of the election of Pope Francis, members of the entire Polish Bishops’ Conference will celebrate a Mass for the Pope at the Temple of Divine Providence in Warsaw. It will be presided over by the Apostolic Nuncio, Archbishop Salvatore Pennacchio. The liturgy will be telecast live on TVP INFO. Addressing the pilgrims gathered in St. Peter’s Square for the Angelus on the fourth Sunday of Lent, which – Pope Francis reminded them – is called “Laetare” Sunday from the first words of the antiphon of the Eucharistic liturgy and that mean "to rejoice", he said we are invited to rejoice in God’s great love for humanity. Pope Francis visited the Rome-based Sant'Egidio Community which is celebrating an important anniversary this year, and is known for its service to peace, to the poor, to migrants, to the sick, to interreligious dialogue. It is currently involved in peace mediation in the Central African Republic. Pope Francis has encouraged members of the Sant’Egidio Community to continue courageously in their mission to build bridges, keep dialogue open, stay close to the poor and the discarded, and pray for peace. The Pope’s words came on Sunday afternoon during a visit to the headquarters in Rome of the Community that is celebrating its 50th anniversary. During a celebration of the Liturgy of the Word inside the beautiful Santa Maria in Trastevere Basilica which the lay organization uses to shelter the homeless and offer Christmas lunch to the poor, the Pope spoke with gratitude of the work carried out by the world-wide network of Sant’Egidio volunteers and its mission to broker peace and accompany the poor. Following the death of German Cardinal Karl Lehmann, Bishop emeritus of Mainz, on 11 March 2018, the Holy See Press Office provided a brief biography of the beloved bishop and theologian. German Cardinal Karl Lehmann, Bishop emeritus of Mainz Germany, was born on 16 May 1936 in Sigmaringen, Germany. He was ordained for the Archdiocese of Freiburg im Breisgau on 10 October 1963 and held doctorates in philosophy and theology from the Pontifical Gregorian University, Rome. He was an assistant to Fr Karl Rahner at the University of Münster. After earning his "habilitation", he taught dogmatic theology at the Johannes Gutenberg University, Mainz. He was a member of the Central Committee of German Catholics and the Jaeger-Stählin Ecumenical Circle. He later taught at the Albert Ludwig University, Freiburg im Breisgau, and was a member of the International Theological Commission. He also edited the official publication of the documents of the Joint Synod of the Dioceses in the Federal Republic of Germany (Synod of Würzburg, 1971-75). Created and proclaimed Cardinal by Saint John Paul II in the consistory of 21 February 2001, of the Title of S. Leone I (St. Leo I). Died on 11 March 2018. Pope Francis has sent a telegramme of condolences to Bishop Peter Kohlgraf, Bishop of Mainz, following the death of Cardinal Karl Lehmann on Sunday, 11 March. Pope Francis has paid tribute to the stature of deceased German Cardinal Karl Lehmann recalling his fruitful activity as theologian, Bishop and President of the German Episcopal Conference. He assured his heartfelt prayers for those who are grieving the loss of the Cardinal whom, he said, the Lord has called to Him following a grave illness and much suffering. The Pope concluded his message imploring Jesus to give his faithful servant fulfillment in the Kingdom of heaven. Pope Francis says true Christians don’t stop going forward after receiving the first gift of grace. They are always advancing, seeking after the joy of being with the Lord. Pope encourages French politicians in their commitment to common good. Pope Francis meeting politicians, parliamentarians and bishops of Marseilles provice. Pope Francis on Monday met a group of French politicians along with their bishops from Marseilles episcopal province. Pope Francis on Monday encouraged French politicians in their commitment to the common good by creating a more just, human and fraternal society, keeping in mind especially the needs of migrants and refugees. Meeting some 300 politicians, parliamentarians and their bishops from the Marseilles episcopal province, the Pope urged them to build bridges between people who find themselves in different social, economic, cultural and religious conditions, as well as between generations. He also expressed the Church’s appreciation for a political commitment that is inspired by the desire to create favourable conditions for people to live together, respecting their differences and being attentive to those in precarious situations, especially the most fragile. Bernice Albertine King visits Pope Francis while in Italy to receive an award recognizing her commitment to non-violence and peace. Pope Francis received in audience this morning the daughter of Martin Luther King, Jr, Bernice Albertine King who presented the Holy Father with the sixth volume of the series entitled "The Papers of Martin Luther King, Jr: Advocate of the Social Gospel, September 1948-1963". A series of books in Italian, entitled “Theology of Pope Francis”, has been released by the Vatican Publishing House (LEV). Monsignor Dario Edoardo Viganò, the Prefect of the Vatican Secretariat for Communication, who presented the series, speaks about it. Pope Benedict wanted to give a contribution, very significant as always, to the interior spiritual unity of the two pontificates. Thus Msgr Dario Edoardo Viganò characterizes the letter sent to him by the Pope Emeritus. Regarding the magisterium of Pope Francis, Benedict writes that “there is interior unity” between his pontificate and that of Pope Francis, his successor. Pope Benedict’s letter was presented by its recipient, Msgr Dario Edoardo Viganò, during a press conference presenting “The Theology of Pope Francis,” a series of 11 books written by 11 different authors, and published by Libreria Editrice Vaticana. The news conference was held in Sala Marconi in the headquarters of Vatican Media. “I applaud this initiative,” writes Pope Benedict. “It contradicts the foolish prejudice of those who see Pope Francis as someone who lacks a particular theological and philosophical formation, while I would have been solely a theorist of theology with little understanding of the concrete lives of today’s Christian. Many of the central themes guiding the Pope’s subsequent actions were laid out in his first apostolic exhortation. The Holy Father’s focus on personal relationships is making a difference.